So much more than just standing. Not only did I recently appear on a photo looking anything else but 5 months pregnant (what I am not! Well, perhaps I can blame my shirt a bit, too?!) but I just noticed how “off” I looked, and felt. Yes I was tired and exhausted but wasn’t aware how badly I showed that! I usually try to pay attention to my posture but guess tiredness took its toll. Our posture often shows how we feel. I even take it as far to say that our posture sort of carries our feelings. It can make us feel more tired, exhausted, tense, and stressed but as well help us to feel less tired, less stressed, happier, prouder, more powerful, stronger and more relaxed. A strong core and awareness of how we stand and feel goes a long way when it comes to a proper standing. Tension, stress and fear often give us a slouched posture, with shoulders rolled for- and upwards, a short neck and we appear shorter. Our posture literally puts us down and shows that we carry a heavy burden! Relaxed, happy and confident feelings and thoughts make us stand tall, straight and with shoulders down, showing that we do have a neck. We can as well overcome or at least lessen these feelings of being tired, exhausted and anxious by a proper alignment. A posture awareness goes a long way to make us more at ease without having to do a lot! Below a little overview about common postures problems. Do you find yourself in it? 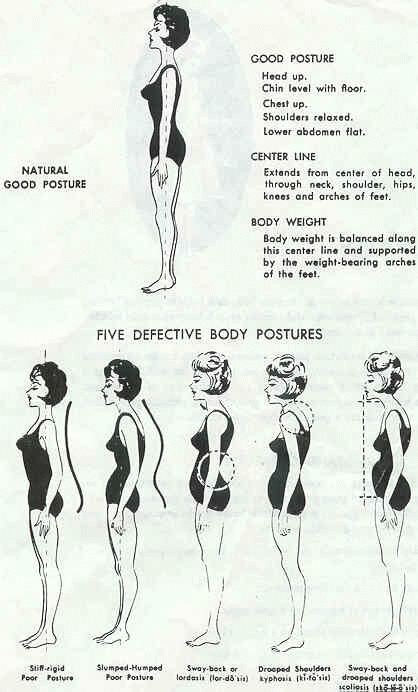 When you are out there today, give yourself a posture check! Do you stand tall, shoulders down and slightly back yet relaxed, chin up and looking straight – and do you engage your core?! Stay tuned for more information on posture and on how to stand strong and tall!